Heat rises quickly over the next few days as a ridge of high pressure settles into the Ohio Valley. Temperatures should rise to 90-93 on Saturday, Sunday and Monday. This will likely qualify as a "heat wave" because it's a three-day stretch above 90. 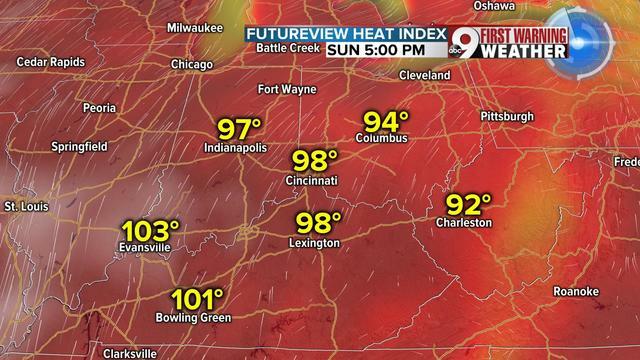 But the other glaring issue this weekend has to be talked about: the heat index. 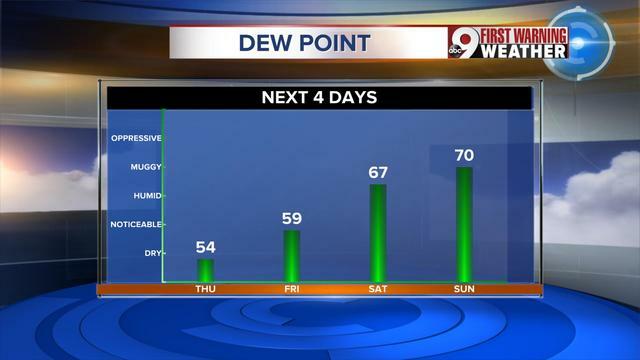 Dew points will climb steadily this weekend along with the heat and this will amplify how this heat feels. Yes, we are talking about a heat index. First, here's a look at the rising dew point. Saturday's forecast will be mostly sunny with a high of 90. But once you factor in rising dew points from low to upper 60s during the day, it's guaranteed to feel hotter. The heat index should be around 95 that afternoon. But Sunday and Monday are really the days to watch. With a dew point of 70-72, this is the definition of oppressive humidity. That puts an extra strain on our bodies alone. Coupled with the heat, we are looking at heat index values between 97-102 on both days. Staying hydrated and giving your body a break from the heat, especially since this is a three-day stretch of this weather.